The Yamaha Solid Top Acoustic Guitar scored high marks in all categories and is our top pick. This beautiful acoustic guitar comes with a host of features that make purchasing it an incredible value. It is the perfect sounding guitar for experienced players and beginners. The full, round tone of this guitar is very pleasing to the ear. The construction is high quality and features a gorgeous, high-gloss natural finish. There is a lifetime limited warranty on this guitar. Choosing an acoustic guitar can be a real challenge if you are a beginner. There are a huge amount of sizes, shapes, finishes and brands available so unless you know about these things, you could end up feeling quite overwhelmed. The guitar you choose is a very special thing for anyone so care should be taken when deciding what you will get. Acoustic guitars can be played with amplifiers which is one of the reasons they are so popular. They are very portable and people can play them anywhere. We spent over 43 hours researching and testing 20 different brands and kinds of acoustic guitars and found that tone, design, and materials used in construction were most important. With all of the choices available, having a guide like this one, that will tell you about three of the top ranked choices and that will provide additional information for you to learn, can make the process of choosing a guitar and enjoyable one. The Yamaha FG800 is from a long line of FGs (folk guitars) that continue to please the players that purchase them. It is the perfect choice for a first guitar that will provide a full, round tone that is sure to impress. This beautiful guitar comes with a bunch of features that make it a superior value as well as a perfect sounding instrument for beginners and experienced musicians alike. Features include a solid Sitka spruce top, a nato body, reliable die-cast tuners, and a rosewood fretboard. The black and white body binding, tortoise pick guard and a beautiful, high-gloss natural finish that shines under stage lights. The FG series has been a favorite of millions of great musicians for over 40 years. They are respected and well liked for their quality, dependability, playability and value too. The FG series was introduced in the 60s and has been stated to be the best guitar in its league. Everything about the FG800 is designed to provide an outstanding playing experience. Yamaha provides a limited lifetime warranty for this guitar. 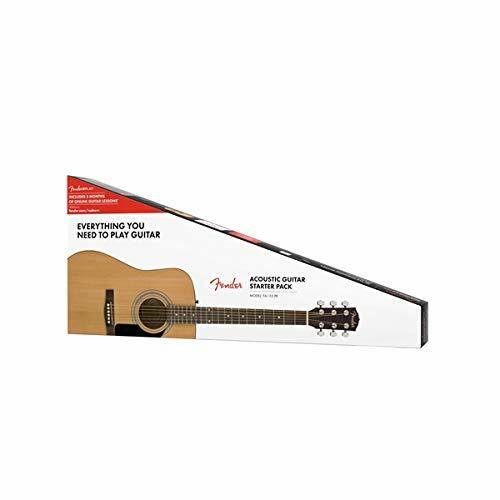 If you are just getting started as a guitar player, this Fender Acoustic Guitar Bundle will provide everything you need. All the accessories you need are included in this package. Users will get a spruce top guitar with a beautiful sunburst finish, agathis back and sides, a rosewood fretboard and bridge, a black and white rosette, chrome tuners and much more. The smooth playing experience this guitar provides will please both beginners and experienced players alike. Along with this beautiful, full resonant sounding guitar you will get a gig bag, guitar strap, picks and even a second set of strings. Add the clip on digital tuner to keep the guitar in the right tune and you are good to go. You will be all set to start learning or playing right out of the box. If you have someone special wanting to play guitar, this bundle will thrill them and keep them motivated to keep learning. This deep dreadnought has a full acoustic resonance that is available in a wide range of colors that appeal to all kind of players and would-be players. Oscar Schmidt has been the leader in folk music since the 1886 when they presented its incredible line of acoustic guitars. The premium look, quality hardware used in construction and excellent pricing make this guitar a fantastic value as well. The professional look that Oscar Schmidt guitars have is due to the distinctive headstock bridge and pickguard designs that these guitars have. This OG2 gives musicians excellent tone and has a spruce top, gorgeous mahogany back and sides, rosewood fingerboard, die-cast tuners and a truss rod that is adjustable. The new line of OG2 has a stunning and expensive looking marquetry that goes all along the perimeter of the guitar and the sound hole too. This guitar is the perfect first guitar or even second guitar. The unique spalted maple top is breathtaking. Additional features include a decorative rosette, decorative body perimeter inlay, standard X bracing, and a dreadnought style body. This guitar makes a beautiful gift that will keep the new guitar player motivated and excited to practice every day. The manufacturer provides the consumer with plenty of peace of mind by offering an excellent lifetime warranty as well. The guitar that someone chooses is a very personal thing. Most people that play the guitar and purchase one fall in love with their guitars like they are extensions of themselves and in many ways they are. There are literally hundreds of different guitars on the market today and that can make choosing the right one very difficult, especially if you are a beginner and don’t already know a lot about acoustic guitars. The three top choices we have reviewed are at the top of the list for looks, tone, style, performance, value and many other things. Anyone of these three choices will make a perfect guitar for someone just starting out or someone looking for a practice guitar or extra instrument to have on hand. Many end up loving these choices more than the high dollar ones. Continue reading below to learn everything you should look for when it comes to choosing the right acoustic guitar. This information will help you sort through the hundreds of choices out there and will enable you to make an informed decision on the right model for your preferences. Picking the right guitar is kind of like picking a pet. People become extremely protective and possessive of their instruments so taking the time to learn how to choose the best possible one for you is very important. We’ve got many tips and pieces of information that you can use to narrow down all of the choices so you’re not overwhelmed. We have listed the important points to consider when deciding on your first…or your next guitar. Choosing the right sized guitar is very important to the learning process especially for kids that want to learn to play. A guitar that is too big will be very difficult for a child to hold and also to make the proper reach for the cords and strumming. In addition to that, having their arms up over the large guitar can really be very uncomfortable for them as well. While adults are typically comfortable with a full sized guitar, if your child is younger, they will have a much more enjoyable introduction into guitar playing with the right sized instrument that is designed for their shorter arms, smaller bodies and smaller hands. The adage ‘you get what you pay for’ is very true when it comes to many things and guitars are on this list. In many cases you get even less. Cheaply made guitars are nothing but a money waster as you will have to end up replacing them again and again. It is better to buy the best guitar you can afford and have it for years. When you are looking for your guitar, be sure to choose one that you love the look and finish of as well as the other features. Having a guitar you visually love will motivate you to pick it up and practice a lot more. Tuners are so crucial, especially to a beginning player. They are as important to the success of learning to play a guitar as picks and strings are. You want to ensure that your guitar is kept tuned to standard pitch for many reasons. First of all, the best musical tone will come from a guitar that is properly tuned. Second, most guitars are initially set up to be played at standard pitch. Another reason is that standard pitch is the musical standard for most instruments. Having your guitar tuned above that standard pitch can result in broken strings or even damage to the guitar. Having it tuned too far BELOW the standard pitch can cause problems too such as string buzz against the fretboards. The type of wood used in making the guitar plays a large part in how the guitar will sound. The top, back, sides, and neck are the most important parts of the guitar when it comes to the overall tonality of the instrument. Other parts that can enhance or constrain the sound include the bracing, binding, bridge and fretboard. The later factors don’t define the sound of the guitar but can definitely add to the tonal effects. While the type of wood that is used to make a guitar is important, other factors that will be a part of the overall sound of the guitar will be the design of the guitar, how skilled the crafts man is and the quality of the wood itself. Spruce – This is a common material used in crating the top of the guitar. The most common type of spruce is Sitka. It combines the traditionally lightweight properties of softwood and rigidity to create a high velocity of sound. It also retains its clarity when played hard. Cedar – Most often, Western Red Cedar is used to create the top part of the guitar. The reason for this is the warm, balanced sound that is created when Red Cedar is used for the tops. It responds well, providing a rich response to lighter playing. Mahogany – this beautiful wood has a low response rate compared to other top woods. It has a low overtone and a good amount of density as well. Guitars that have tops made of mahogany usually make excellent country blues instruments due to the strong, punchy tone they produce. It produces a high velocity of sound when it is chosen as the wood for the back and sides of the instrument. Maple – different types of maple will offer different results. Big Leaf, Sugar and Bearclaw Maples are more acoustically transparent from the lower response rate and internal damping. The characteristics of the top are audible with adding any type of tonal coloration. Rosewood – Rosewood is used often in the creation of the fretboard and top as well. It is known for its high response rate and board range of tones. It also has a lot of strength and even darkness in the in the tone range. It has an overall richness filled with strong mids and highs that round of the sound nicely. Body style – Acoustic guitars come in a wide range of sizes, shapes and colors. You can choose a smaller, travel size guitar or a dreadnought and everything in between. The style of the body of the guitars determines the tonal emphasis and sound projection ability. Sometimes you may have to choose between two elements that both seem important such as tonal quality versus comfort. Guitars that have cutaways make it much easier for a beginner to access the upper frets easier, while they are learning. Electronic Capability – Many acoustic guitars come with preamplifiers and pickups to enhance and “electrify” the acoustic sound. This is very good for venues where you have to make sure you can be heard no matter where you are playing. Neck – The size of the player’s hand is what determines the kind of neck you choose. The thickness and width of the neck correlates with the size of hr body of the guitar and how many frets it has. Most often, acoustic guitars have 12-14 frets. When a guitar is listed as 12-fret or 14-fret, they are only counting the frets that are clear of the body of the guitar, not the total number of frets. Intonation – The intonation of a guitar determines if the guitar can continue to play in tune the farther up the neck you move. The distance between frets above the 12th one needs to be precise so the guitar continues to play in tune no matter how high you play. Tonewood – Different types of woods produce different tones. The majority of guitar makes feel that the top of the guitar is the most important element in determining how the sound quality of the guitar is. The types of wood used in the creation of the guitar will also determine its cost as well. Tuning Machine – The type of tuning your guitar has is also of great importance. The tuning machine is what makes the guitar sound beautiful. Have an out of tune guitar and ANY guitarist, regardless of skill level, will sound terrible. If the guitar has enclosed machine heads, the will resist both rust and other corrosives. The enclosed nature requires less maintenance or replacement. Bridge and Fingerboard – The materials used on these parts of the guitar do affect the sound of the guitar, but those effects are minimal. It won’t make or break the sound of the guitar like the body or top will. Guitar Finish – Different finishes can also affect how your guitar vibrates. This isn’t something that you can do anything about. You don’t need to worry about choosing one finish over another because of sound. Choose the finish that makes you excited to look at and play. When you follow the tips and information that we have provided above, you should be able to purchase your guitar with confidence and it won’t matter that it’s your first one. The knowledge provided here should give you a little more insight into the manufacturing of a guitar and how that manufacturing affects sound quality and tone. Guitars are investments and some can last decades with the proper care so choosing the perfect one for you is a process. Don’t settle for something that doesn’t sound or look the way you want it to. Your first guitar is an important purchase and one you should feel great about afterwards.